ORLANDO, Florida -- The U.S. Fish and Wildlife Service is proposing to upgrade the status of the U. S. breeding population of wood storks from Endangered to Threatened under the Endangered Species Act (ESA). The proposal follows a comprehensive review, conducted by Service biologists, of the best available scientific and commercial information about the species’ status. The wood stork is the only true species of stork nesting in the United States. Since its original ESA listing as endangered in 1984 the U.S. breeding population has shown substantial improvement in the numbers of nesting pairs as a whole and the expansion of its breeding range. The three-year averages during the past 10 years (2001 – 2010) range from 7,086 to 8,996 nesting pairs, all above the 6,000 nesting pair benchmark average established for reclassifying the species as Threatened, but well below the five-year average of 10,000 nesting pairs needed for delisting. The proposed reclassification would not change any conservation or protection measures for the wood stork under the ESA. Rather it would recognize the stork’s ongoing recovery and the positive impact that collaborative conservation efforts over the last two decades have had on breeding populations. With a continuing trend, the species could become suitable for de-listing from the ESA. Therefore, addressing the threats associated with habitat loss, including the protection of natural wetlands through partnerships and the focused management of public lands, remains a conservation priority for the Service. When the Service originally listed the Southeastern U.S. portion of the population, the wood stork’s range included Florida, Georgia, South Carolina, and Alabama and breeding was primarily in central and south Florida. Historically the Florida Everglades and the Big Cypress National Preserve once supported large breeding colonies. Today its range includes portions of North Carolina and Mississippi with significant nesting in Florida, Georgia, and South Carolina. Biologists believe man-made changes in the Everglades and Big Cypress ecosystems have contributed to the bird’s expanded breeding range. The Natural Resources Conservation Service (NRCS) Wetlands Reserve Program has restored over 200,000 acres of wetlands in Florida and more than 115,000 acres in Alabama, Georgia, and South Carolina during the past 18 years. Thousands of acres of wetlands are also being protected on private lands to assist in habitat and wildlife protection through restoration in conjunction with establishing conservation easements. Wetland losses are being avoided, minimized, and mitigated through project consultations and the regulatory process. Alabama: Ongoing wetlands restoration projects, such as those undertaken in several U.S. Fish and Wildlife Service National Wildlife Refuges (Eufaula and Choctaw NWRs) and the State of Alabama's Wildlife Management Areas (Demopolis WMA and Upper Delta WMA), are providing excellent foraging habitat for post-breeding wood storks dispersing following the nesting season. Georgia: Through public and private partnerships with NRCS, nearly 20,000 acres of key wetlands are restored and/or being managed for the benefit of a wide variety of wildlife, including nesting wood storks. In 2011, Georgia had 2,160 nesting pairs. Mississippi: Along the eastern part of the state, wetlands associated with federal lands (including the Sam D. Hamilton Noxubee National Wildlife Refuge, with its moist-soil waterfowl management, and the Tennessee-Tombigbee Waterway) attract feeding wood storks, as well as other long-legged wading birds and wildlife. North Carolina: Wood storks were first observed nesting in North Carolina in 2005, with the two known colonies occurring on private lands. While the wood storks nest on private lands, the birds are routinely observed foraging on a broad range of federal and state protected wetlands throughout southeastern North Carolina. In 2011 the nesting survey found 96 nesting pairs bringing the State’s three-year average to 141 pairs. 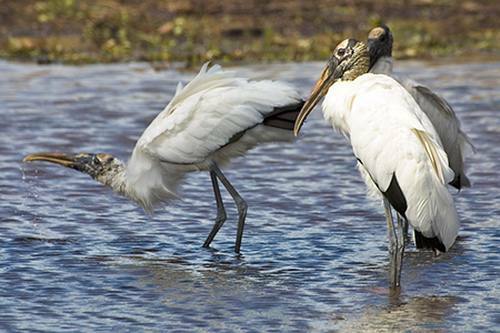 South Carolina: Public and private partnerships, such as the Ashepoo, Combahee, and Edisto (ACE) Basin Task Force protect and manage coastal estuaries and are contributing to a growing number of wood stork nesting colonies. In 2011, South Carolina’s three-year average was 2,031 nesting pairs. The announcement, which will publish in the Federal Register in coming days, also constitutes the Service’s 12-month warranted finding on a petition to reclassify the wood stork which was submitted by the Pacific Legal Foundation (PLF) and Biological Research Associates (BRA), on behalf of the Florida Home Builders Association (FHBA). The historical and current status and distribution of the wood stork, its biology and ecology, and ongoing conservation measures for the species and its habitat. Wood stork nesting colony location data (latitude/longitude in decimal degrees to confirm or improve the Service’s location accuracy); nest census counts and survey dates; years when a colony was active or not; years and dates when a colony was abandoned (fully or partially); and annual productivity rates (per total nest starts and per successful nests) and average chicks per nest estimates from U.S. colonies. Current or planned activities within the geographic range of the U.S. breeding population of the wood stork that may impact or benefit the species, including any acquisition of large tracts of wetlands, wetland restoration projects, planned developments, roads, or expansion of agricultural or mining enterprises, especially those near nesting colonies and surrounding suitable foraging habitats. Federal eRulemaking Portal: http://www.regulations.gov. Follow the instructions for submitting comments for Docket FWS-R4-ES-2011-0020. U.S. mail or hand-delivery: Public Comments Processing, Attn: FWS-R4-ES-2011-0020; Division of Policy and Directives Management; U.S. Fish and Wildlife Service; 4401 N. Fairfax Dr., Suite 222; Arlington, VA 22203. The Service will post all information received on http://www.regulations.gov. This generally means that any personal information provided also will be posted. Comments and information must be received or postmarked on or before 60 days after the date of publication in the Federal Register. Submissions merely stating support for or opposition to the proposed action without providing supporting information, although noted, will not be considered in making a determination. Section 4(b)(1)(A) of the ESA directs that determinations as to whether any species is a threatened or endangered species must be made solely on the basis of the best scientific and commercial data available.